It's pricey for data recovery software, but if you often work with irreplaceable files like photos and videos then it could be an investment that's well worth making. Our test results were very impressive, but try the free demo first to see if it's the right tool for you. File recovery software should be installed as a prophylactic measure – otherwise you risk overwriting your missing files during the install process. That means you have to make your choice now, before disaster strikes. Stellar is one of the biggest names in data recovery, and when you take Windows Data Recovery for a spin, you soon see why. First of all, it's flexible. Stellar Data Recovery Professional offers a choice of quick options at the outset. You can perform a general search for any kind of deleted file, or narrow the field to Microsoft Office documents (including Word, Excel and PowerPoint files), emails, photos, audio and videos. If you’ve lost an entire folder, you can also attempt to retrieve that. Advanced settings the ability to preview files during scans. This makes scans much slower, but could be extremely helpful if you’re looking for an image file, enabling you to halt the scan when you see it. If you stop a scan prematurely, don’t worry – Stellar Data Recovery Professional logs incomplete scans, so you can resume it later. Often, if you’ve lost a specific file, you’ll know exactly what it was called and what the extension is. Delving into the advanced settings lets you specify a file type. There are scores of options, helpfully divided into different categories including media, documents, text and archive formats. If you know the file type you’re looking for but can’t see it listed, you can set up a custom filter using the Add/Edit Header tab. Unfortunately this isn’t clearly explained within the software interface, so you’ll need to check out the online help to learn how it works. You’ll then be prompted to choose a location – your desktop, your documents folder, a particular drive or a custom location of your choice. You can also recover a lost partition – a feature you rarely see in free recovery software – or recover data from a disk image. Once that’s done, just hit ‘Scan’. If you don’t find what you want immediately, there’s also the option of performing a deep scan, which will take longer but will turn up many more results. As with all data recovery software, there's no guarantee that you'll be able to recover your lost files, but in our tests, scans were quick and the results were impressive. It’s a shame there’s no traffic light system to indicate the recoverability of files, though for media files the preview function works well. It might not be absolutely the most beginner-friendly file recovery tool, but it’s hard to argue with its results. 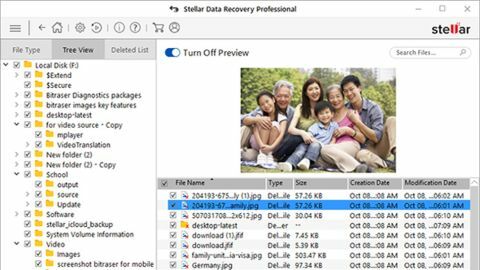 Stellar Data Recovery Professional is excellent data recovery software, and we’re recommend it particularly highly if you’re a keen photographer looking for missing photos (from an SD card, for example) or an uncommon file type. The only real drawback is that Stellar Data Recovery Professional costs considerably more than rivals like Recuva Pro and DMDE Standard, but it could be well worth the expense if the other tools fail to turn up the goods. If you’re not sure whether to invest in Stellar Data Recovery Professional, the free trial lets you see which files and folders the full software would be able to recover for you, so you can compare it with the results from cheaper or free data recovery software. If you're impressed and your wallet can afford the hit, it could be a very good decision.